Discount tickets to Block 37 AMC Theatres. 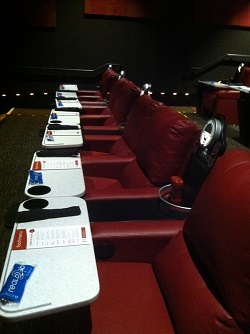 The fantastic new 11 screen AMC Dine-in Theaters at Block 37 are open! Current holiday offer: spend $30 on AMC gift cards get free small popcorn. Offer good in theaters only. Costco sells four $25 gift cards for $79.99.These gift cards are redeemable at Movietickets.com ONLY and convenience fees apply. These are redeemable for tickets at 150+ theater chains in the US, including, AMC. Delivered via E-mail. These Movietickets.com gift cards cannot be used at AMC Block 37 theaters currently (They do work at AMC Rivereast 21). The tray tables swivel out for easy access. Costco is supposed to be selling AMC Green and Red passes but they are not currently available online. AMC Green passes are good for any show unless it’s a no passes show. Red passes are good for shows that have been out for at least two weeks. Green and Red passes cannot be used for any Disney movies. Without using an AMC pass this movie would have cost over $15. Cha-ching! If you have a business or a friend who does you can buy in bulk directly from AMC National Sales. AMC allows business-to-business sales in multiples of 50 passes (Green passes only) for $9.00 each plus $9.95 shipping ($9.20 per ticket). If 50 passes exceeds your requirements try to get some friends to go in with you. Restrictions apply. Review the AMC website thoroughly before purchasing. If you have a Visa Signature credit card you can buy $25 in instantly redeemable Fandango Gift Cards and get $5 off your order available exclusively through this page for Visa Signature cardholders. Fandango charges a service fee of $1.50 per ticket for Block 37 shows. You can find heavily discounted Fandango and AMC gift cards sold through gift card resellers by searching through Gift Card Granny. The reseller websites buy gift cards at a discount from people who don’t want them and resell them at a discount to others. Fandango cards can be used to buy tickets online for most AMC theaters. Check the warranty period for these reseller gift cards and use them as soon as possible. Save money on movie tickets. 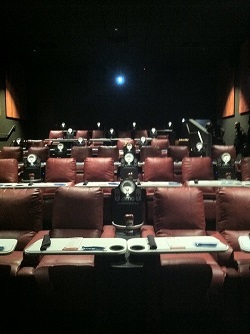 The Cinema Suites feature luxury recliners, an extensive menu and full cocktail bar. Guests must be 21 and over. You will be able to choose your movie and showtime and reserve your seats according to your preference online ($1.25 surcharge per ticket). Press the call button at your seat and a server will arrive to take your order. Orders are taken within 15 minutes. 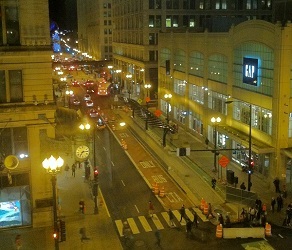 Full service bar, MacGuffins, and lobby seating area with views of Dearborn Street. View from the Lobby seating area. Snack and shares $8: wings, fries, tots, sushi, etc. Burgers $12: 6 oz. beef, grilled chicken breast, fried chicken, vege. Bison $2 upcharge. Bowls $12 full/$8 side: grilled chicken and quinoa, caeser and chopped salads. Baskets $16: chicken tenders, fish and chips, fried shrimp, tacos, etc. Mac and cheese $12: traditional, gumbo, mediterranean, luxe. Drinks: Mixed $9.49-$11.99, draft beer: $5.99-$8.99, bucket, wine by the glass $6.99-$15.49. Bottles $25.99-$54.99.